Video conferencing is rapidly moving out of the conference room and onto the desktop, smartphone, and tablet. 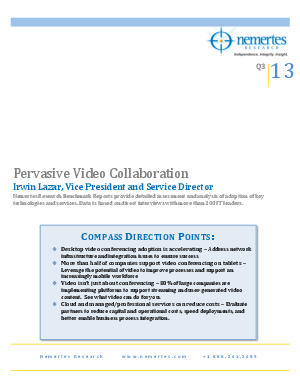 Thanks to inclusion of video as a core UC component, enterprise technology leaders are increasingly deploying video to individuals as part of their unified communications initiatives, while integrating personal video into room systems, and enabling conferencing beyond the enterprise. Spurred by the growth of consumer services such as YouTube, companies are making significant investments in video content delivery and management; finding use cases ranging from formal training and distance learning, to simply enabling employees to create their own video as a collaboration mechanism. Taken together, enterprise technology leaders must plan for a future in which video is pervasive, both real-time conferencing as well as user-generated content. Finally, enterprise technology leaders should evaluate the opportunity for cloud-based video conferencing solutions to reduce costs and improve flexibility.